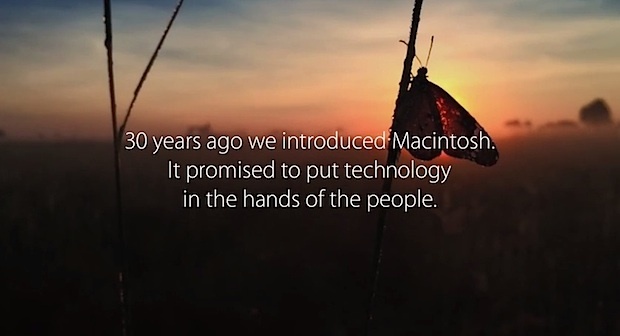 Apple has released a short film celebrating the 30th anniversary of the Mac. The video is titled “1.24.14”, signifying the date on which the 30th Mac anniversary fell, and emphasizes people doing various interesting things with Apple products. The video itself consists of segments filmed around the world on that date using the iPhone 5s. “On January 24, 1984, Apple introduced the Macintosh. And with it a promise that the power of technology, put in the hands of everyone, could change the world. On January 24, 2014, we sent 15 camera crews all over the world to show how that promise has become a reality. The Apple companion site for the video is different from the 30 Years of Mac site that featured the icon font. It’s not clear if this will run on television alongside other Apple ads, or if it will be limited to the web. Some speculation suggests the video was originally intended to air during the Super Bowl, but those who watched the Seahawks game hoping for an Apple ad (or Broncos appearance) were left empty handed. Thanks for editing autocorrect and low coffee, Jules, very helpful! Sixth grade should never be hyphenated. Thanks everyone for the edits and suggestions, but let’s try to keep this on topic. My 9-person startup makes the microscope camera the kids used to study an insect ( http://www.exolabs.com ). Another example of how Apple technology disappears into the background and empowers normal people to do really cool things. With typical Apple secrecy, we didn’t even know we’d be in the commercial until it was posted this morning! That’s awesome! Any near term plans to update for the Lightning adapter? Thanks Paul! I can’t speak to our product road map. But we are aware that we need to support the Lightning connector. In the mean time, the camera works great with the Apple Lighting-to-30-pin adapter. I use it all the time with my current-gen iOS devices. Perfect, the Lightning to 30 Pin adapter is a great solution. What an awesome product, I could see it being a huge hit for education. Absolutely; teachers and students just light up when they use it. Anyone know what music they used for this commercial?